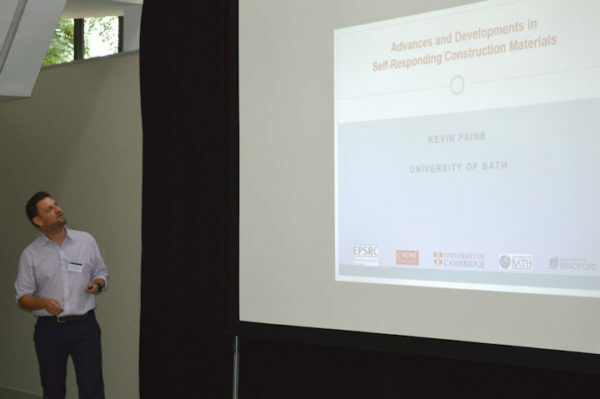 Dr Kevin Paine gave the opening keynote lecture on advances and developments in self-responding construction materials at the annual event of the EPSRC funded Self Repairing Cities project, at the University of Birmingham. The ensuing discussions demonstrated the clear synergy between RM4L and the Self Repairing Cities project which both aim to deliver a built environment that maintains and heals itself without human intervention. Whilst the ambition in RM4L is to do that through advancements in the materials themselves, the Self-Repairing Cities project are working towards delivering a fleet of robots and drones that will perform the monitoring and repair work.